Material: Steel with paint spraying. Weight: Approx. 1.5 kg / 3.3 lbs. Pole Inner Diameter: 3.5 cm / 1.38 ";Pole Height:27 cm / 10.63 ".Suitable for the 7.87ft-10.49ft (2.4cm-3.2cm) umbrella with pole diameter less then 1.38 inches. Inner Diameter: 9 cm / 3.5 "
Outer Diameter: 46 cm / 18.1 "
Because the base itself is relatively light, when used, it is recommended to press things on the base bracket first (without pressure, only if there is no wind or breeze) to avoid the wind blowing down. Open: every foot of the surface has a bayonet lock fixed with the feet, when open the leg of the first, let him out of the slot, then open outward until the bayonet lock to another bayonet lock slot, according to this method open them one by one in four leg. Unscrew the top screw first, then insert the lower lever of the umbrella and tighten the screws. When you gather, just pull your foot out, pull it out of the slot, and then close it up until the bayonet lock is stuck in another slot, and you'll be able to close the four legs in this same way. -If you have any questions, please feel free to contact us, and we will get back to you within 24 hours. ✔ SPECIFICATION - Pole Inner Diameter: 3.5 cm / 1.38",suitable for the 7.87-10.49ft (2.4-3.2cm) umbrella with pole diameter less then 1.38". The adjustable range of the pole diameter from 2cm / 0.79" to 3.5cm / 1.38"; when less than 2cm / 0.79", using filler to make it tight. Weight Bag：Dia. 46 cm / 18.1 ". ✔ MATERIAL - The Umbrella Stand is made of the high quality steel with paint spraying. Durable for use many times. Round Umbrella Base Weight Sand Bag is made from the Oxford cloth. 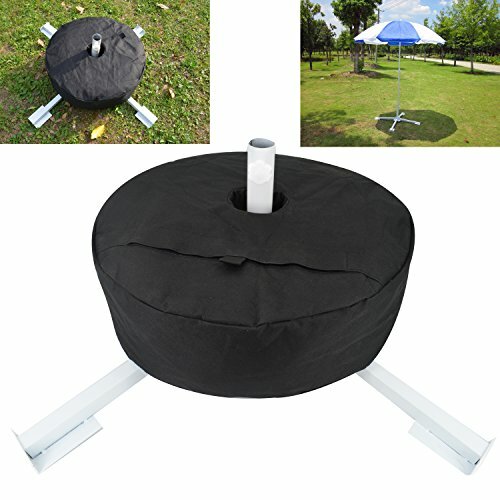 ✔ FOLDABLE & ADJUSTABLE - Both of the umbrella stand and the weight bag can be easy to fold and easy to carry. Center hole can be adjusted with , suitable for diffrent sizes. ✔ PACKAGE INCLUDING - 1 x Foldable Umbrella Stand ,1 x Round Weight Sand Bag. ✔ WHERE TO USE - Generally applicable to fishing umbrella, beach umbrella, sunshade umbrella and so on. If you have any questions about this product by Elfjoy, contact us by completing and submitting the form below. If you are looking for a specif part number, please include it with your message. Festnight Patio Umbrella Stand Outdoor Parasol Umbrella Base 15.7" x 15.7"
MoreSpace NO Heavy Bulky weight needed. NEW patio umbrella and flag stand. Strong secure hold. Llight weigt. Easy to install.